I use the same parking garage everyday. It's at Girard Square. The garage is interesting to say the least. You enter through an alley where you drive past appliance movers and unconsciously hum Dire Straits' "we got to mooove these refri-gerators, we got to move these color TVvvvvvs", past dumpsters and up a steep winding ramp to get to the parking levels. Levels 3 and 4 are reserved for monthly passes (which I have but somehow I never got an assigned parking spot). Level 5 is the roof, where I park everyday. There is no Level 2 for some reason. The elevators are the smallest elevators ever and only hold 4 people or 800 pounds - yeah right. Did I write elevators? With an "s"? Yes, there are two, but only one works. You can imagine how long we wait. And you can also imagine that we cram more than 4 people and Cocoa (my dog) into the elevator when it arrives. Yesterday, I parked around 12:30, took the elevator down to the street and noticed a little bird hopping around near the dumpsters. I immediately knew that it wasn't a sparrow. It was a junco. What's a junco doing in Center City? Then I noticed that it's wing was twisted and it couldn't fly. It was hopping around quite well and I knew that I would never be able to catch it out in the open like that. Plus, there was a homeless man projectile vomiting about 20 feet away from it. (I swear, I'm not smart enough to make this stuff up). So I mumbled "circle of life, circle of life" and headed to the office. I thought about the bird once or twice but it went out of my mind at the office because there was a bigger story being told. Ebony does our scheduling. Her boyfriend works for the Center City District doing street cleaning and is assigned to our area. He called Ebony in the morning to tell her that he just witnessed a man jump from Loews Hotel. What a tragedy. He jumped from the 33rd floor. His body laid on the sidewalk for 2 hours while people gawked at him under the sheet. What a shame. Poor man. Poor Justin. I feel bad that he had to witness that. I left the office early so that I could get home, pick up Sammy and drop him off at Di's before hockey practice. Up the elevator, into the truck, down , down, down the winding ramp. What's that hopping around the ramp? Yep. It was the junco. Now I had to do something. I parked the truck in the alley, got the construction bucket (that I found at Sandy Hook on Friday) and a raincoat out of the back and proceeded back up the ramp on foot to catch the bird. Cars were trying to get up the ramp. People were staring at the nutjob with the bucket. Oh yes, I know what I look like. N-V-T-S: Nuts! I finally cornered the bird in the elevator lobby (see how the story comes back around to elevators?) and got it into the bucket. I phoned Connie to let her know what was going on and brought the bird home. At home, we decided to put the bird in the shower stall overnight. I put some sticks for a perch, shredded newspaper (I don't know why but it seemed like a good thing to do), seed and a saucer of water. We left the light on for awhile so that the bird could see the food. I sprinted out the door for hockey practice. The bird was fine overnight. He ate some seed for sure. Around 1:00 I got him into a box by chasing it around the shower with a net that I use to clean the pond (another AFV moment lost) and took the bird to the Shuylkill Center Wildlife Rehab Clinic where he will be evaluated and fixed if possible. Don't ask what happens if they can't fix him. . . I gave them $50. 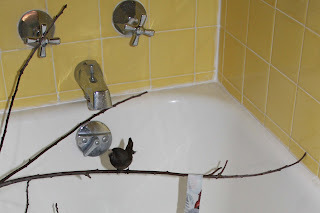 Here is a photo of the bird in the shower. Wish him luck. Well, I thought that I would share this with you because it does have to do with birds. 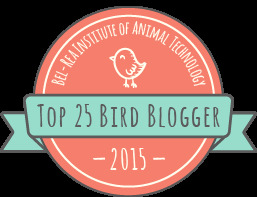 And this is a bird blog.